Hello Summer Blog Hop ! Are you ready? The blog hop has arrived and you have 3 days of fun and free kits downloading! If you experience any problem with the download, please contact me. Have fun creating something fabulous with all of the kits you will collect! This blog hop has 20 blogs to stop by. Get over there and see the amazing and beautiful kits that all designers created! Make sure you visit all the stops on the blog hop these 3 days : July 6-8,2012. Elaine Anjos  <-- you are here!! We are officially half way through 2012!! It's July!! It's summer and we have a new Blog Hop! Do you know how blog hop works ? You simply click on the link where blog hop starts, this is the first stop. Download the freebie and then follow the next designer on the list. All the designers worked hard to put a lot of goodies together for you! Enjoy!! I will be waiting for you on July 6. Don't forget, the first stop on the blog hop begins at Three Owls In a Nest !! Nós estamos oficialmente no meio do caminho de 2012!! Estamos em julho! E' inverno aqui no Brasil, e verão nos EUA. E para comemorar o verão por lá, estarei participando de um novo blog hop! Você sabe como um blog hop funciona ? Você simplesmente clica no link onde o blog hop começa, essa é a primeira parada. Nesse primeiro site você pode fazer o download do kit grátis (freebie) e depois seguir para a outra parada: o site da próxima designer na lista. O blog hop também é conhecido como blog train. As designers trabalharam com carinho para criar esse Mega Kit para você! Ele contém papeis e elementos de 20 talentosas designers. Venha participar do blog hop nos dias 6 a 8 de julho! Divirta-se!! Dia 6 de julho eu irei publicar a lista das designers e seus respectivos blogs. E lembre-se, a primeira parada é no blog Three Owls In a Nest !! Yesterday I had a great time with my family. We prepared cod fish to our lunch. It is a Good Friday tradition here. I hope you all get to enjoy this weekend with family and loved ones. I prepared a freebie kit as a easter gift. After Easter, when you're ready to scrap about the memories you made, you can use these cards to tell your stories and document your 2012 easter memories. Hope you enjoy the cards. You can grab the freebie by clicking on the image below. 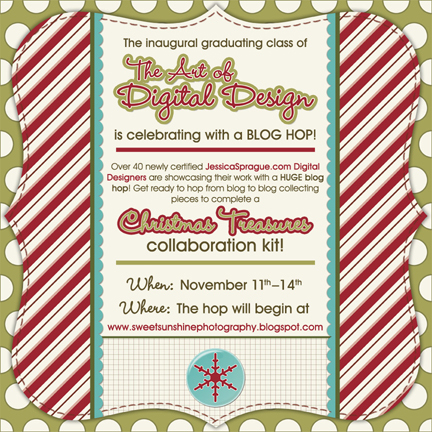 Hello Art of Digital Design 2 Blog Hop ! Have fun creating something fabulous with all of the kits you will collect! This blog hop has 18 blogs to stop by. Get over there and see the amazing and beautiful kits that all designers created! Make sure you visit all the stops on the blog hop these 3 days : March 29-31,2012. Elaine Anjos Designs <-- you are here ! GIVEAWAY | One person will receive my Spring Mega Collection kit when it will be released on April 15th. TO BE ENTERED | into this giveaway please leave a comment below. Comments will be closed at 12pm Pacific Time on Saturday. The winner will be posted on Sunday, April 1st. Please be sure to check back to see if you are the winner. Thanks for stopped by ! Art of Digital Design 2 is one of Digital Design classes from JessicaSprague.com. This class is amazing and has Carina Gardner as instructor. Some students organized a BLOG HOP. These new designers created digital freebies that you will love! All the designers worked hard to put a lot of goodies together for you! Join us to have fun and get some amazing mini kits ! I hope you all had a Blessed Easter ! Did you have already organized your Easter photos ? Did you have already done your scrapbook pages about Easter ? Here is my contribution. Thanks so much for your patience! I'm sorry it took so long! I have been suffering from gastritis this month and last week it got worse. I prepared this mini kit freebie with some stickers about Easter. These stickers are in PNG format. You can use them at your handmande or digital art. If you experience any problems with the download, please contact me. One person will receive the Easter/Spring Stickers kit. TO BE ENTERED into this giveaway please leave a comment below and tell me: How often do you use stickers in your pages? I'll choose a winner on Tuesday night. =) It`s Christmas time ! Merry Christmas from our home and family, to yours! Thank you so much for visiting my blog this year and allowing me to share posts, words and digi scrap with you. I hope you have a wonderful holiday!! This is Thanksgiving time and my husband Marcelo and I remembered last year when we were in USA. He had to work on some projects at the company site in Plantation, Florida. We arrived there on november 22th. It was the first time that we went there and we were very excited about our new adventure. We were invited by one of my husband co-workers to have Thanksgiving dinner in his parents house. It was a very nice night and we were honoured to had this opportunity to celebrate this important date. We could taste traditional Thanksgiving recipes like the famous Thanksgiving turkey, mashed potatoes and delicious deserts ! This American family was so kind opening their home to us to celebrate this special day.This is a great and wholehearted memory that we have forever. It is time to have gratitude. To celebrate this, I created a Thanksgiving freebie elements kit. I hope you enjoy!